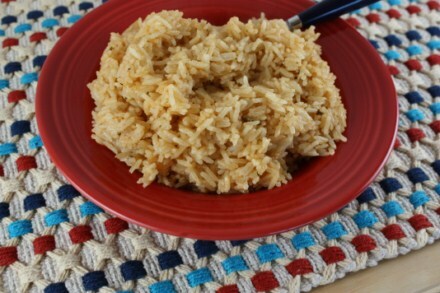 This rice is a recipe that I just quickly threw together one night when I needed an easy side dish. I was inspired by a rice recipe that my friend Jessica posted about, but I made mine a little different than she did. I know that I have mentioned several times now how much I love my homemade Emeril’s Seasoning. I really do use it all the time. It is a great seasoning for not only meats, but for recipes like this one today. You can easily use the store bought version of Emeril’s if you have some, but I prefer the homemade since it is less expensive and I can control the spiciness. Add rice and stir rice in hot oil for 1-2 minutes or until rice starts to turn whiter in color. You are basically frying the rice like you do in my Mexican rice. Cover and cook on low for 18-20 minutes or until rice is tender. I love rice and think it goes with everything. Thanks for sharing. That looks delicious. Thanks for sharing the spice recipe. I may just have to try that! I’m guessing this is not instant rice, but am I guessing correctly? Thanks for the recipe! @Michelle T, Sorry it took so long for me to get back to you. This is regular long grain rice, not instant. Good question. I love that Emeril gave the recipe for his spice mix. I have made batches twice since reading about it on Life As Mom and Good Cheap Eats. I always seem to have the needed spices in my cupboard in adequate amounts anyway. I never thought about using this for rice. What a great idea! Thanks for the tip. OH Lynn! This is a keeper!!!! Hubby said ‘Add this to the rotation”. I made jambalaya with it. I first sauteed some onions and garlic in olive oil, then added some smoked sausage, then browned the rice a little, added water, baby bam seasoning and half a chicken bullion cube. It was delish and so quick!! Thanks so much for posting!! @Chrissie, I am so glad that you liked it! Your variation is great. I was thinking the same thing about adding meat to it to make it more of a main dish. Thank you for letting me know how much you liked it. Will this work for brown rice? Do you think it would taste ok? @Sarah, I think it would work fine. You would just need to adjust the cooking time and I think the liquid amount.